Here are six strategies that companies use for keeping healthcare costs down without reducing employee benefits. Companies often deploy one or more of these strategies. Your employees may not realize the value in the benefits they currently have. If they're not using their benefits wisely, then you are not getting the most value out of your money. Educate employees on the benefits and how to use them. Make it easy for your employees and their families to stay healthy by promoting prevention. This can be done through education, wellness programs, and a company culture of health and wellness. After all, everyone needs motivation and support to adopt healthy habits. If decide you need to eliminate some of your benefits, be sure to keep the ones that your employees care most about. Target your benefits for better efficiency and effectiveness instead of cutting based on price alone. You can do this by considering your workforce - Do you have many people in a certain age group? Younger? Older? Do you have more women than men? Tailor your benefits to your key employees. Consider which programs will have more value to your employees and to your bottom line. A CDHP refers to a health plan that involves the consumer to make decisions about their health care. CDHPs encourage employees to make informed decisions and spend wisely - which can lead to lower costs for the company. CDHPs come in various forms, but most commonly this means offering a high-deductible health plan paired with a spending account for out-of-pocket costs such as a Health Savings Account (HSA) or Health Reimbursement Arrangement (HRA). For example, a company switches from a lower-deductible plan to a high-deductible plan to realize premium savings. To keep the coverage level and employee exposure the same, they offer an Integrated HRA to cover the additional out-of-pocket deductible costs. The employer reimburses employees through the HRA for their additional deductible costs. The company achieves savings because on average, employee utilization of the HRA is only 30-50%. Another strategy used by companies is shifting the costs of health insurance more to employees. While this is a less popular strategy from an employee morale standpoint, it's a decision that many companies have made over the last decade. It is especially common for companies to reduce contributions for dependent coverage. 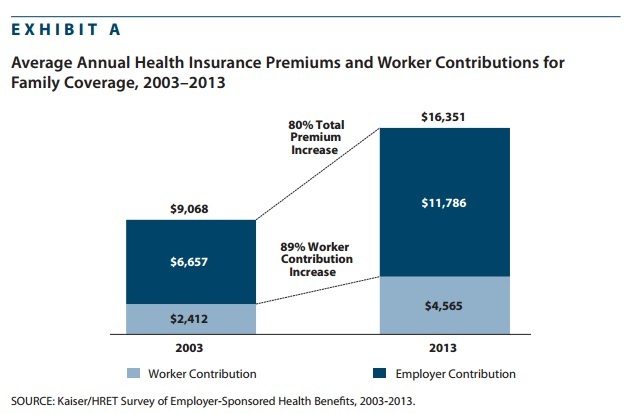 For example, from 2003 to 2013 premiums that employees pay for family coverage increased 89% compared to the overall premium increase during the same time of 80%. Many businesses are transitioning away from group health insurance all together and choosing to offer health benefits with a pure defined contribution approach. With defined contribution, the business controls all health benefits costs while providing the same (or better) health insurance coverage to employees. They simply set what they can afford and provide employees health insurance allowances. Employees use their allowance to purchase individual health insurance coverage and are reimbursed by the company, up to the amount available to them. Read more: 4 Ways You Control Health Benefits Costs with Defined Contribution. What strategies did we miss? 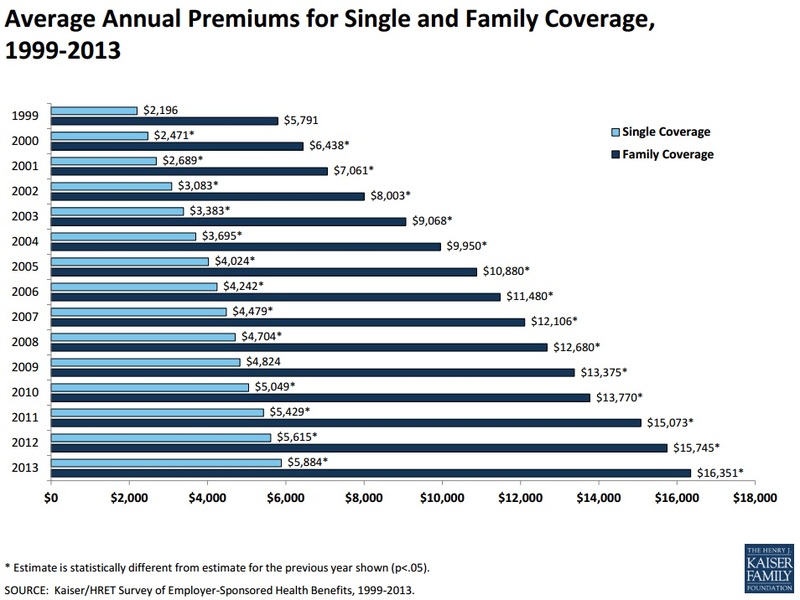 What are your strategies for keeping health insurance costs down without cutting employee health benefits? Leave a comment or question below.